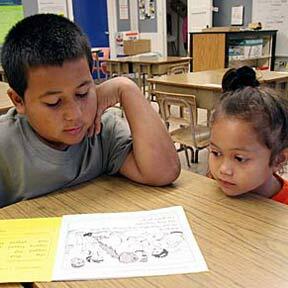 Palolo Elementary fifth-grader Brazen Malong reads to his 5-year-old sister Kalinani. Brazen, along with other fifth-grade volunteers, shows up on campus at 7:30 a.m. to tutor his sister. The school may face federal sanctions because of low test scores.